My guess is that we can all tell stories of defining theological moments in our lives. Moments were we realized that the answers we were getting from parents, Sunday School teachers, or learned university professors weren't able to meet the challenge of the questions we were asking. Borrowing the theory of scientific revolutions from Thomas Kuhn, our theological paradigms (Step 1) were facing too many anomalies--unexplained data points (Step 2)--leading to a theological crisis (Step 3). A paradigm shift--a theological revolution (Step 4)--was in order. We've all wrestled with theological anomalies and the crises they create. Sometimes the anomalies can be incorporated by adjusting the theological paradigm. Just like the astronomers who added epicycles to Ptolemy's perfect circles of geo-centric planetary motion. In a similar way, we create theological epicycles to fit new and troublesome data into our current theological systems. But sometimes the data can't be incorporated. Too many epicycles and the system gets clunky and baroque. I distinctly remember one of these moments in college. The professor was talking about the great faith of the friends and commending them to us as an example. But I had zeroed in on another part of the text. I raised my hand. "The text says Jesus forgave the man's sins. Here and elsewhere in the gospels it appears that Jesus was able to forgive sins." "Yes, that's true. Jesus had the authority to forgive sins. Jesus was God Incarnate." "Yes, I agree. But all that makes me wonder about why Jesus had to die." "Well, if Jesus could forgive sins, if God can just forgive sins because God can do anything, then why did God need a blood sacrifice?" At this point the professor went on to explain that the answer to my question was that Jesus's blood flowed both backward and forward in time. So when Jesus was forgiving sins in Luke 5 it was under the blood shed on Calvary flowing backward in time. Those sins weren't really forgiven until after Jesus died. The forgiveness in Luke 5 was anticipatory. I let this answer pass, but something snapped inside of me. "Bullcrap," I said in my head. I had smelled an epicycle. Something was getting brushed aside. Something important. Later on, I realized it was the gospel itself. 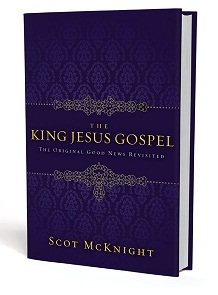 Let me commend to you the new book by Scot McKnight, The King Jesus Gospel. Many of you read Scot's blog Jesus Creed so you are aware of the book. And many other blogs have posted reviews as well. But if you missed it I wanted to make you aware of this very good book. More, I expect to use many of Scot's ideas in the years to come on this blog. So I'd like to formally get those ideas out on the table. Scot's book orbits around a simple question: What is the gospel? Scot suggests that we to try to answer that question before going far into his book. And I'd ask you to do the same thing: In a sentence, what is the gospel? Evangelicalism is known for at least two words: gospel and (personal) salvation. Behind the word gospel is the Greek word euangelion and evangel, from which words we get evangelicalism and evangelism. Now to our second word. Behind salvation is the Greek word soteria. I want now to make a stinging accusation. In this book I will be contending firmly that we evangelicals (as a whole) are not really "evangelical" in the sense of the apostolic gospel, but instead we are soterians. Here's why I say we are more soterian than evangelical: we evangelicals (mistakenly) equate the word gospel with the word salvation. Hence, we are really "salvationists." When we evangelicals see the word gospel, our instinct is to think (personal) "salvation."... We ought to be called soterians (the saved ones) instead of evangelicals. My plea is that we go back to the New Testament to discover all over again what the Jesus gospel is and by embracing it we become true evangelicals. One of the reasons I wanted to review Scot's book is that I'd like, as might many of you, to use the label soterian from time to time to describe how many Christian think. It is customary in America to refer to the "gospel plan of salvation," by which we mean how an individual gets saved, what God has done for us, and how we are to respond if we want to be saved...[Now it] may strike you as uncommonly odd for me to make this claim, but I'm going to say it anyway: this Plan of Salvation is not the gospel...[W]hat I hope to show is that the "gospel" of the New Testament cannot be reduced to the Plan of Salvation. In the beginning was the gospel. That gospel is now found in 1 Corinthians 15. This is the gospel: The life, death, burial and resurrection of Jesus. More specifically, the gospel is how the life, death, burial and resurrection of Jesus fulfilled God's promises to Israel and, through Israel and Jesus, God's promises to the nations and all of the Created Order. There is a Person at the very core of the gospel of Paul, and until that Person is put into the center of centers in Paul's gospel, we will not comprehend his--scratch that--the apostles' gospel accurately. The gospel Story of Jesus Christ is a story about Jesus as Messiah, Jesus as Lord, Jesus as Savior, and Jesus as Son...If I had to sum up the Jesus of the gospel, I would say "King Jesus." Or I would say "Jesus is Lord" or "Jesus is Messiah and Lord." The gospel is the proclamation of a new new reality that has dawned upon us in Jesus Christ. This is why the gospel is an apocalypse (an "unveiling"). In the life, death, burial and resurrection Jesus is revealed (apocalypse) to be both Lord and Christ. Proclaiming the gospel is to proclaim this news. Jesus is both Lord and Christ. Of course, once you hear this news, you will want to adjust to this new reality. How to adjust to this new reality is what we call "the steps of salvation." Stepping back, some might object that Scot is marking a difference that doesn't exist. But the implications of focusing on the gospel rather than upon personal salvation are pretty profound. I refer you to Scot's book for his discussion on this subject (creating what Scot calls a "gospel culture" rather than a "salvation culture"). But the most obvious implication that Scot points out is this: the gospel is bigger than my personal salvation. This really is a Copernican paradigm shift, moving from a me-centric story to a Jesus-centric story. The me-centric story of salvation is just about me "getting saved." Harps in the clouds and all that jazz. But a Jesus-centric story--the proclamation that Jesus is Lord--is a whole lot bigger. And, truth be told, a whole lot scarier. Plus, the Jesus-centric, gospel story answers my old undergraduate questions about Luke 5. That story isn't about me and my guilt. That story isn't about a theory of salvation. That story is a gospel story, a story about Jesus. That story is the proclamation of the Good News. Jesus is Lord. But the whole church universe is built on protecting those epicycles. We've come to depend upon those epicycles. We've got whole tribes dedicated to protecting some of them. And I'm not exactly that young anymore. Why do I get the feeling this is really one of those "let the dead bury their dead moments?" Can't I just go and quietly bury my mom and dad? Then I'll be ok with what you are saying. I love this summary of the Gospel - that Jesus is Lord. I was really thinking about this last week as I prepared to preach on the angel's appearance to the shepherds at the Lord's birth. The angel says to the shepherds, "Behold, I bring to you good tidings of great joy that will be to all the people." In the Greek, the word for "bring good tidings" is "euangelizo," i.e. announce the gospel. So, the angel is saying, "I evangelize to you great joy that will be to all the people." The gospel is great joy to "the people" - here the Jewish people, and as made clear throughout the Gospels, also to the nations. And where is this great joy from? "For unto you is born this day a Savior, who is Christ the Lord." The gospel is the birth (and the life, death, and resurrection) of a.) our Savior, who will save His people from their sins, b.) Christ, the long-foretold King, and c.) the Lord, YHWH made flesh. This first declaration of the gospel expresses it perfectly. Oh, and of course, this Savior is born "in the city of David" - emphasizing His fulfillment of the promise to Israel. Love it. Does McKnight get into what it means--what difference it makes in how we see the world--to proclaim the Jesus story? It's clear that the Jesus story is a rejection of Roman political power, 1st Century Jewish religious power, and the self-interested aspiring for power of those without... It would be interesting to see evangelicals (soterians?) think about THAT. It also shows, and Scot points this out, that Jesus himself proclaimed the gospel. I also think this view of the gospel sits well with all the Christus Victor stuff I've been writing about. I haven't read _King_Jesus_ yet, but I will soon. One of the things that solidified this kind of thinking for me was to understand the thoroughly political use of euangelion by the ancients. Proclaiming a euangelion about Jesus was to proclaim a new political order in the face of the existing order. Yoder's _Politics_of_Jesus_ helped immensely there. This kind of thinking about gospel helps to make it easier to think of faith as trust: faith is trusting the proclaimed ruler enough to give allegiance to the ruler. And allegiance plainly affects behavior. Given the extent to which the church has sold out to other rulers in the past 1800 years, recovering a biblical discipleship --- boy, do I sound like a Campbellite --- seems nearly impossible without a heavy dose of King Jesus Gospel. But who will listen to that kind of proclamation except for those without a vested interest in continuing rule of the principalities and powers? Reconsidering the above, "heavy dose" isn't enough. We need to intentionally choose to re-orient Christian life around this gospel. My infamous suggestion a while back that evangelical culture is irremediable derives from just this kind of feeling: nearly the whole institution is built to do Something Besides King Jesus, so why should I work to bring the institution into line? Why not send invitations to the poor and those on the highways? Why not let the dead bury their dead? And in the back of my mind, I hear, "You, too, think that you can make a clean break from the past and re-establish 'New Testament Christianity'?" And because Jesus is Lord, we can now see through his light that God never does (did) violence to flesh and blood. "I had smelled an epicycle." That is just plain funny. Your last sentence is great. I harbor no illusions there. If anything my guess is that is the lesson of the reformation. Our institutions are transitory. Trying to purify the church is vanity. But we can be clear in our own witness and lives. Umm. . . . Odd that the story Jesus came to fulfill (Israel's story = Old Testament), and the story written by the earliest followers of Jesus (= New Testament), and the teaching of Jesus' followers through the ages, all of whom confessed Jesus as Lord, did not so testify. You might still be right about God. But "we can now see" strikes me as funny--who's the we, and why are you pretending that the confession of Jesus as Lord inevitably leads to your conclusion? Yeah--this is an interesting point--the quickest way to make Scot's point that I've seen, is to ask a Bible study or Sunday School group, "What was the gospel Jesus preached?" It corrects a version of Christianity that starts with Acts 2, instead of with Matthew, Mark, Luke, and John. Your "how did Jesus forgive before he died" question reminds me of the whole thief-on-the-cross question that's constantly brought up in immersionist circles like ours. No baptism = no salvation. My favorite "epicycle" answer is that Jesus could forgive the unbaptized before his death and resurrection--but not after. A similar version is that those who didn't hear the message of Jesus as Lord could be saved in OT times, but no longer! Both answers, of course, make Jesus' death and resurrection Bad News--all to protect our epicycles! The first smelly epicycle that hit me like a massive wave was when it dawned on me that those around me who kept trying to impress upon me at an early age that we followed the New Testament Christians had no respect for church history. That was when I was 11 years old and was walking through some Roman catacombs. Scary. I've since been suspicious whenever I meet groups who make such lofty claims. Lately I've been thinking about the fact that Jesus himself is described as "preaching the gospel" to the people several times in the Gospels. I'm pretty sure even the message "Jesus is lord" was not on Jesus' speaking agenda. After all, that phrase reflects later Pauline theology. So if you want to distill the Gospel down to its fundamental premise, ask yourself what Gospel Jesus was preaching during his lifetime. Ew, I hate black liquorice! I haven't read this newest book by Scot McKnight yet. This review moves me more toward making a purchase! The title "king" and "father" have plenty of negative associations in my life. I get skittish when people use those terms in reference to Jesus / God, kind of like if the question of whether one is an "evangelical" Christian comes up. In our current times, kings and kingdoms (e.g., politics) has been conflated with much of evangelical Christianity (the vocal, high-visibility brand of it, anyway), and the subject is depressing to me, at the moment. I despair of the whole situation, which I suppose is wimpy for a King's servant. As I have been trying to reconcile this in my thoughts, I remembered a part of the Christmas carol 'O Holy Night.' (Wasn't there a post about that here recently?) Specifically, I remembered "His law is love, and His gospel is peace." Wow, is the 'Literal English Translation' a powerful expression of the gospel! I think I like that version best, overall. That is the King of kings that I know and love. That is truly Good News. So did anyone else just assume they knew what epicycle meant until they Googled it and realized it was something completely different? (Amazing analogy, by the way). Because Jesus is Lord, "we," i.e. "all flesh" (not only those who confess) have opportunity, are capable of, and open to seeing, as in Isaiah 40:5. I've been thinking an awful lot lately about the way that Jesus leveraged his power and entitlement, giving it away for others with none. Then discussing it with... soterians? (I kind of like that!) I was shot down on this point. God's will for our lives is for us to prosper in family-oriented institutions in which we are blessed with plenty because of our faith and our righteous works. Of course, when phrased like that, the soterians would probably flat out deny it. But a denial doesn't change the way they live out their beliefs. I was twenty years old, and sitting in an emergency prayer meeting at my church. One of my close friends had committed suicide, and families, the youth, and his friends were all present to hear the pastor speak. What I heard from the church leadership was a foul epicycle: the staunchly-held ideas of the church regarding suicide suddenly melted away to reveal a vague, wishy-washy no-man's-land so that people could interpret it as they most felt comfortable with. I didn't comprehend exactly, but I remember asking our other close friends, "So... is he in heaven, like they just implied, or is he in hell, like we've been taught to believe?" It was a helluva way to wake up, but myself and those other young men did wake up that night, and we began to press in to find a gospel that was big enough to handle what we'd lived through. So is the gospel to do with the revelation the Name of the Jesus ..... With all of the rich meaning of the word "name"
"However, I'm pretty sure Jesus was *not* preaching the following:"
"• His own death (which had not yet occurred) or resurrection"
Take a look at Luke 18:31-33. "• Eternal torment for those who failed to join a religion that did not yet exist"
Of course He didn't do this since 'joining a religion' has nothing to do with eternal torment. OTOH, take a look at Mark 9:43, for one. "• The Romans Road to Salvation"
Again, true. The reason being that He was talking to Jews under the law. What they had to believe for 'salvation' was that He was who He said He was, the son of God, their Messiah. He called it the 'gospel of the kingdom.' Quite different from the gospel of grace that Paul revealed. Take a look at Matthew 4:23. The middle one is the simplest geo-centric model with no epicycles. On the left is the helio-centric model which nicely accounts for the retrograde motion. On the right is the geo-centric model which adds an epicycle to account for the motion. The metaphor I'm using in the post is the comparison between the left (sun-centered) and right (earth-centered) models. On the right you must account for the data by adding an epicycle. But that makes the model, and is visually obvious, too "re-worked." The paradigm shift occurs by rejecting the epicycles and adopting a whole new view, moving to the leftward sun-centered model, the Coperican Revolution. No more epicycles. I always thought they were used by circus performers suffering from serious allergies..
when Scott came out to Pepperdine almost three three years ago now. which speaks too the point. "kinda like a car salesmen"
Act 2:30 Being therefore a prophet, and knowing that God had sworn with an oath to him, that of the fruit of his loins he would set one upon his throne; Act 2:31 he foreseeing this spake of the resurrection of the Christ, that neither was he left unto Hades, nor did his flesh see corruption. Act 2:31 he foreseeing this spake of the resurrection of the Christ, that neither was he left unto Hades, nor did his flesh see corruption. Act 2:32 This Jesus did God raise up, whereof we all are witnesses. HOW DOES THE FATHER MAINTAIN RIGHTEOUS JUDGEMENT BY CURSING A RIGHTEOUS MAN..."god with us"
(UNDER LAW, SIN SEPARATES..."DEATH") AND THIS IS BEFORE RECONCILIATION OR WHAT PAUL CALLS VINDICATION IN TIMOTHY. reference being " a Shuan Penn movie" can't remember his name? I'm not sure how to either agree or disagree with your comments. I agree with most of the separate points that you make, but disagree, I think, with the gist of what you say--but I'm not even sure of that. Here's the point. In the earliest gospel account (that is rich enough to follow a narrative progression) Jesus is depicted as teaching his disciples about both his death and resurrection, and both are key to the gospel--the good new of the kingdom being at hand: the Son of Man will be the one who leads the kingdom AND will be the one who is resurrected in the way Jesus foretold his disciples. So I guess it's your first point that I think need to be questioned, but also the other four to the extent that they may incorporate the gospel announced by Jesus in the Gospel According to Mark. I'd have to say the same thing about Richard's points in the post--because one must decide prior to knowing what to do with Paul's recital of the Apostle's shorthand version of the gospel whether it is to be informed by Mark, for the crucial reason that mark purports to give us an insight in Jesus' view of this. Personally, Mark is crucial to grounding Tillich's view of the gospel--a view I noted in a comment to Richard already here. It's a view that makes Jesus' intentional overturning of the existing orders the centerpiece of its hermeneutical strategy. But its a core question in another very interesting way: it takes a big step toward full-blown orthodoxy as defined by what Lewis called "mere Christianity": the consensus of the Church over 2,000 years. The question here is about whether that consensus seems to be true to a strong reading of the earliest narratives. And the proto-narrative--and therefore THE earliest--would be Jesus' own. Forgive me, but it's THE question for biblical scholarship. If I could be 18 again, addressing that question is what I would do with my life. I agree with the factual aspects of what you claim, but would note that whether Paul's theology, including his understanding of salvation--is consonant with Jesus' view is a question of extrapolation--including whether Paul ought to have done so (extrapolated) at all. Very tricky question, and entirely over my head, I'm sorry to say. You say that Paul 'extrapolated.' He seems to say that he did no such thing as far as I can tell. For example, he says in Galatians 1:11 Now I want you to know, brothers and sisters, that the gospel I preached is not of human origin. 12 For I did not receive it or learn it from any human source; instead I received it by a revelation of Jesus Christ. I think we need to go back a little bit further than Paul. In the Gospel of Mark, Jesus stated that God's promised Reign had finally come. He said that THAT was the 'gospel'. We have to has ourselves what Jesus meant by that. The answer to THAT question is the key to understanding the NT (and St Paul, specifically) understanding of the 'gospel'. He refers, surely, to the road to Damascus experience. The extrapolation is what he did with his revelation, theologically speaking--and with the tradition handed down to him, which surely he used as an interpretive lens in dong his theology. But he certainly did do theology, including work on the idea of the gospel and salvation--unless, of course, that too was experienced as directly as the Damascus experience... Not. Great, great analogy. "This really is a Copernican paradigm shift, moving from a me-centric story to a Jesus-centric story." And the shift is really that great. As I read the description of what transpired on the Damascus road, I find nothing about the gospel content. What is clear there is that Jesus is God. After that Paul went away into Arabia for three years. Interestingly, that is where Mount Sinai is located and where God gave Moses the law. Anyway, either he got it somewhere by revelation not requiring any human input as he said or he 'extrapolated' which certainly takes the teeth out of it. Because, now we are dealing with 'Paul's gospel' and not Jesus' gospel. Paul saw the resurrected Christ. The resurrection ties these two narrative elements of Mark together: (1) Jesus' intentional march to Jerusalem to meet his death, and (2) that "the kingdom of God is at hand." It does so in Jesus teaching in Mark by identifying the Son of Man--to be the leader of the kingdom--with the one who is resurrected (Mark 10.34). So, seeing the resurrected Christ is exactly the piece that set up the Marcan gospel. I'm slightly bewildered that you are "replying" to my comment and don't have that central idea in mind. Paul, I'm more with you on this than with McKnight. Or at least what I see is that saying the sum total of the gospel is that Christ died for our sins, was buried, was raised, and appeared afterward--that's St. Paul's gospel, not that of Jesus. What about what Jesus actually taught? Yes, St. Paul's near-death experience or vision has captured people's imaginations (and their death anxiety, leading to the focus on personal salvation). But Paul was not concerned about what Jesus actually wanted people to know--Paul's overriding, passion is always for the glorious Christ of his vision. And the more we look only at the death and what came after, the less we pay attention to the lessons of the living Jesus about our responsibility for the Kingdom of God. The more we look at "but Jesus was God who will save us," the more we're off the hook. It's a whole 'nother gospel. My great teacher Tom Olbright said that the task of Nt theology was unification. Whether readers agree or not, taking the canon as a whole....Jesus, Paul, the epistles, Acts and the Revelation, defining the gospel which is arguably the Reason for it all, is a most important task. Do we conflate, determine the core, cynically pronounce the testimonies of faith a disaster of contradictions? For my part, the joy of the quest for unity in asking "What is the gospel?" is a worthy quest indeed! This has a very familiar ring to something Tom Wright wrote in a small book called 'What Paul Really Said'. The book is well worth a read for those who haven't already, and situates Paul within the Biblical witness without the many unhelpful beliefs that have come to surround him. The chapter I'm quoting is entitled 'Herald of the King'. "The word 'gospel' and the phrase 'the gospel' have come to denote, especially in certain circles within the church, something that in older theology would be called an ordo salutis, an order of salvation. 'The gospel' is supposed to be a description of how people get saved; of the theological mechanism whereby, in some people's language, Christ takes our sin and we his righteousness; in other languages again, I admit my sin, believe that he died for me, and commit my life to him. In many church circles, if you hear something like that, people will say that 'the gospel' has been preached..."
And how does Wright define the true meaning of 'the gospel' as it was understood by Paul? (Reflecting on Romans 1:1-5) "God's gospel concerning his Son. A message about God - the one true God, the God who inspired the prophets - consisting in a message about Jesus. A story - a true story - about a human life, death and resurrection through which the living God becomes king of the world. A message which had grasped Paul and, through his work, would mushroom out to all the nations. That is Paul's shorthand summary of what 'the gospel' actually is." I'm interested in what your answer to the following question might be. By the way, my answer is Mark 1:15 (i.e., "The time is fulfilled, and the kingdom of God is at hand; . . ."). And, of course, this was only preached to Israelites (not 21 century Gentiles) who had no trouble understanding what 'the kingdom' was. As far as I can tell, resurrection really plays no part in it. Resurrection in Mark seems to be one of the 'proofs' of who He is, not part of the gospel that He talked about. And I thought it was only the Church of Christ that tried to make 1 Corinthians 15 a definition of the gospel. I'm wondering how that got started… and how it will get stopped. What do you think God meant when He provided 1 Cor 15:1, " Now I make known to you, brethren, the gospel . . ."? David, this is in reply to you--out of sequence, since there is no "reply" button for your last comment. You didn't read my original comment. I already affirmed there what you ask below. But a kingdom needs a king. The resurrection establishes Jesus as the rightful king--the Son of Man. What I find interesting here is that belief "in" Jesus would mean belief in him as the rightful king of the kingdom of God--as established by the resurrection. There is no other question as key to establishing the trustworthiness of the gospel records as whether Mark's Jesus beliefs about himself comport with belief in Christ as presented throughout the rest of the NT, and whether the beliefs ascribed to Jesus about himself in Mark are historically credible. I can't give a good answer, as I'm not a NT scholar. But I am certain the questions are crucial--and interesting. I've been troubled by this all day and here is why. 'Jesus is Lord' is shorthand for something else and on its own lacks meaning. Those of us on the inside of the church know what it means (well some of us), but for an outsider, it has little meaning. I think it points to a much deeper reality and a much more helpful articulation of 'the gospel' (also found in the mouth of Paul): God was reconciling the world to himself in Christ (2 Cor. 5:19). Whether it is Jesus' teaching, healing, hospitality or the cross, it all fits within that simple yet profound statement. Not to mention that John the Baptist was preaching the gospel (Luke 3:18) and that the gospel was preached to Abraham (Galatians 3:8). If the gospel is the story of Jesus' life, death, and resurrection, then why was anyone surprised when he was resurrected? It should have been old news by then. Excellent post, I'm definitely going to start dropping the word "Soterial" now. By the wya, for those who didn't follow the Amazon link, The King Jesus Gospel is $3.99 for Kindle. One please! Sheesh! No wonder I failed so poorly on this theological quibble. (I loved astronomy but did not do well in it, either.) Does it count for anything that I hear 'Earth to Deb! Earth to Deb!'... a lot? Spirit and the Son have received us into their life.